Il reste 150 objets. Veuillez saisir un nombre inférieur ou égal à 150. Great product. A little larger than a standard bar straw or one you would find at a diner. Closer in length to a starbucks straw or one for mc donalds. Great Value Great Quality. I paid a lot more for my original YETI straws, and they weren’t any better! Definitely worth the money! 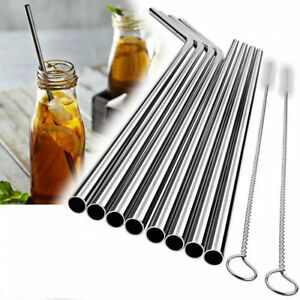 Best stainless steel straws! Great for smoothies easy to clean straws. Good quality product at a great price. Would recommend this product to anyone who is looking for straws and cleaning brushes.